Participants take part in one of the breakout sessions. Wellington held its second of three workshops on options for an expanded Wellington Town Center that could replace the aging Lake Wellington Professional Centre. 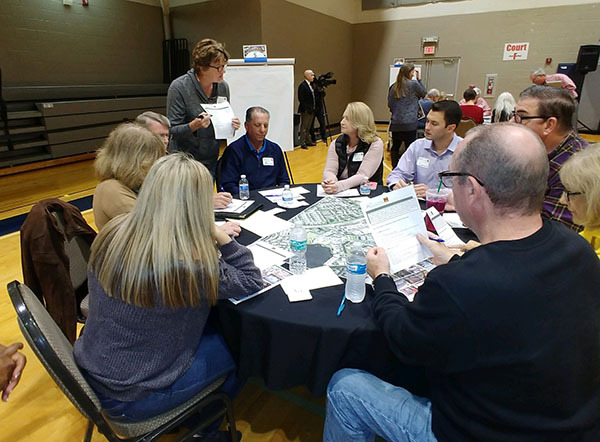 Residents gathered in Wellington’s Village Park gymnasium and were divided into groups to discuss adding features to the Town Center area, currently anchored by the Wellington Community Center, the Wellington Amphitheater and other amenities. 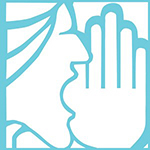 The goal of the breakout workshop was to get public opinion on various features the public favored or not, in order to form a consensus for the locations, uses and features for the area. Options offered for the interior of the park included open space, walking trails, shade structures, shaded walkways, adding a splash pad to Scott’s Place playground, adding a parking structure, altering the Wellington Amphitheater to create a profit-driven venue, and using the area as an open play or picnic area. Other options included relocating the public pool or perhaps replacing the public pool with a family friendly, zero-entry-type pool. Suggestions along Ken Adams Way included adding retail or restaurants, walking trails, adding seating, adding offices and other uses, such as ice cream shops and cafés or restaurants. Another option was for a performing arts center and banquet hall, noting that the location would have limitations as to the size of the venue. The workshop broke into groups to ponder the options offered and add their own ideas. One group favored better access to and expansion of Veterans Park, no added water features, no splash parks, and favored features such as gazebos, noting concerns of public safety by adding some of the suggested features. The group was divided on the idea of cafés and unsure of canoeing off a floating dock, noting concern for parking, lifeguards and the cost. Another group favored green space and no parking structure, but parking adequate to accommodate some additional features of the park. The group also favored a performing arts center, but not at the Town Center site. It was against retail shopping along Ken Adams Way but liked the idea of an executive suite along Ken Adams Way owned by a private entity. Still another table favored walking trails along the waterfront and additional play equipment and non-motorized boat rentals, but no dining facilities. The group favored shade structures, enlarging Scott’s Place playground, no parking structure and favored an open play area. One group voted down a splash park at Scott’s Place and relocating or replacing the pool, although it favored updating it and locating a splash park somewhere. Along Ken Adams Way, the group did not favor retail restaurants, a parking structure or offices, but favored a walking or bike trail. It did not favor a performing arts center and banquet hall. One group favored keeping the pool where it is, favored restaurant facilities included in or attached to existing structures, a parking garage, shade and covered seating near the water, paddle boards or canoes, green space, a splash pad and joining the two nearby lakes. Another group favored keeping amphitheater events free, adding a splash feature for the kids, building a family friendly pool in addition to the existing pool, but did not favor retail or restaurants on Ken Adams Way. It favored a performing arts center, but not at Town Center. Still another table favored promenades or walkways or boardwalks but did not favor restaurants or splash pads. It favored boating and boat docks, covered seating and open space. A table nearby favored a boardwalk and benches, walking trails to shops, a water feature, non-motorized boats, shade structures and mature trees and green space. The group was split on a parking garage and relocating the swimming pool. The final tabulation of the results has not been done, but Assistant Village Manager Jim Barnes said he saw a lot of consistency to the responses that evening. Barnes stressed that this is the start of a long-term project, noting that changes will likely be phased-in over the next 10 years. The next Town Center workshop is scheduled for Wednesday, Feb. 13 at 6:30 p.m. at the Wellington Community Center.